The guide includes my special tours of the area describing 100's of places to visit oif-the_beaten-track, as well as all the best places to eat and drink. 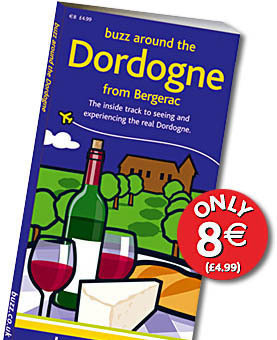 I have also selected the best street markets and shops and written a whole section on Bergerac wines. This includes getting to meet the growers at their vineyards as well as details on where to taste and buy their wines. For those who like to be rnore active I have listed my recommendations of all the local sporting activities from swimming to rock climbing, and, last but not least there's even a section on what to do with the kids should it rain! Plus you'll find lots of information on getting around and enjoying the French lifestyle. "I have written this guide based on my own personal experiences. It is not driven by advertising and I have made every effort to be honest, factual and up to date. I tell it like it is so tha the reader gets a true picture of the Dordogne an hopefully in time will become just as besotted with it as I am." One of the things that makes this guide so good is its tours, which clearly demonstrate the authors love of the Dordogne. Using her inside knowledge of the area, each tour enables yuu to ‘gtt into the real. Dordogne‘, especially the food and wine. Designed so that you can ‘dip in and out‘ at any time, each tour concentrates on a specific area of the Dordogne, carefully steering you in the right direction so that you won‘t miss anything - induding lunch! - and ensuring you have a totally stress free time. For just €8 (£4.99) this pocket size guide is a must have.